Mr. Leroux was born Hervé Peugnet on May 30, 1957, in Bapaume, in northern France. He studied sculpture and art history at the École Nationale Supérieure des Beaux-Arts in Paris before dropping out to become a hairstylist and milliner. In 1981 he met Karl Lagerfeld, who encouraged him to pursue fashion design. He changed his surname for the first time after Mr. Lagerfeld advised him that Peugnet would be too difficult for Americans, the target market, to pronounce. He suggested Léger, liking the allusion to lightness, for which the French word is légèreté. Mr. Leroux, now working under the name Léger, worked alongside Mr. Lagerfeld at Fendi and later at Chanel and freelanced at Lanvin and Diane von Furstenberg before introducing his own boutique, Hervé Léger, in 1984. A fashion line with the new name soon followed, and then came the inception of the bandage dress. Creations by Mr. Leroux on display during his Haute Couture Spring-Summer 2013 collection presentation in Paris. Coinciding with the ascendance of Azzedine Alaïa, the so-called King of Cling, Mr. Leroux’s bandage dress received considerable acclaim. It was designed to encase a figure and enhance it in the most flattering of ways. 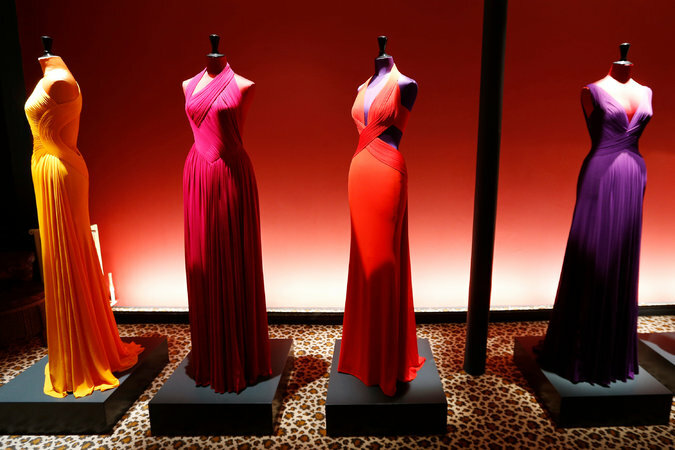 While sales never reached blockbuster levels, the dress’s aesthetic impact would be seen in the work of rivals on runways and on the clothes racks of mass-market retailers. His designs also proved alluring to investors keen to expand the company across product lines and geographical borders. In 1998, Mr. Leroux’s business was acquired by the Los Angeles-based group BCBG Max Azria. It was the first time an American company had acquired a French designer-couturier. In 2000, Mr. Léger founded his own independently financed fashion house, Herve L. Leroux, adopting a new surname that had again been suggested by his old friend and mentor Mr. Lagerfeld. Hilary Swank in a Hervé Léger creation at the 2005 Academy Awards, where she won the best actress Oscar. Mr. Leroux showed a new collection in 2013 as a guest on the Paris couture calendar after a 12-year hiatus from the catwalk. But he never again achieved the recognition or fame he found under his previous name, underscoring the creative and commercial struggles that can ensue when a designer’s name is no longer the designer’s. He is survived by his sister, Jocelyne, who was a partner in the Leroux business. After the news of his death broke, many of those who loved his designs shared tributes on Instagram.